Today (Saturday): Cold sunshine. Wind chill in the 10s, highs in the 20s. Tonight: Clear, cold, less wind. Lows in the 10s, 0s north. Sunday: Sunny, cold, light wind. Highs in the 20s. The weekend starts on a cold note across New England, and it will end on a cold note. Early Saturday morning many cities and towns woke up to temperatures in the single digits above and below zero. By afternoon highs will only climb into the teens north, and 20s south. That’s despite sunshine. Fortunately the wind will be much lighter than Friday, so wind chills won’t be quite as biting. Sunday morning will be clear and cold again, with lows back just above and below zero in Northern New England. 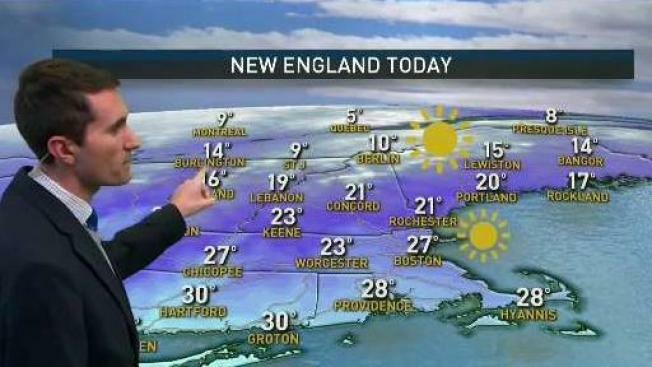 In Southern New England it won’t be quite as cold—expect single digits and teens—thanks to a few extra clouds blowing off the north side of a storm that’s sliding to our south. By afternoon most of us will enjoy sunshine, but a few flurries may drift through Connecticut, Rhode Island, and Massachusetts as the storm glides by. Highs will be in the 20s, including for the Patriots game. On the backside of the storm our wind will turn to the north-northeast Sunday night into Monday morning. That will keep some clouds near the coast, and even produce a few ocean effect snow showers. Otherwise we’ll make it into the 30s by Monday afternoon. Temperatures keep moderating into mid-week, with highs in the 30s to near 40 by Wednesday. A cold front drops into Northern New England shortly thereafter, bringing a few mountain snow showers for mid-week, and eventually colder air to all of us late week. Our next chance for snow showers arrives Friday, and then more unsettled weather is possible next weekend as another storm approaches from the middle of the country. The exact track of that storm will determine if we see rain or snow, or some kind of wintry mix.